On Black Friday, instead of shopping, my co-workers and I decided to drive downtown for lunch… needless to say, it was a bad idea. It took us forever to get there! We were originally going to Sura for their lunch special ($15/20 per set) but it was super busy so we went across to Jang Mo Jib instead. They used to be one block down on Robson before but now they have a new bigger location. 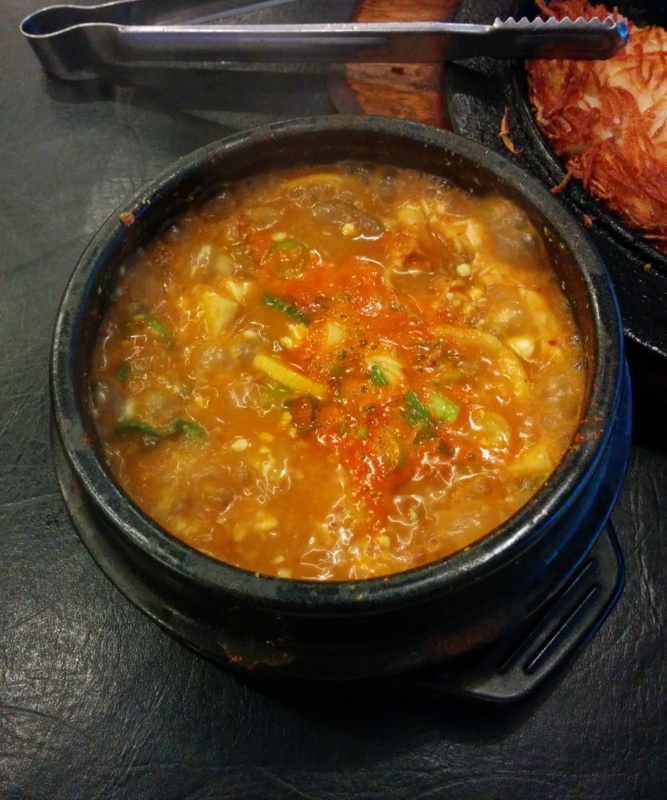 This was the tofu soup with soy bean paste. I’m not really an expert on tofu soup but it seemed like it had a lot of tofu and veggies but more beef would’ve been nice. It’s quite spicy so it will warm you right up! I think we chose medium for the spiciness. This came with a side of rice. 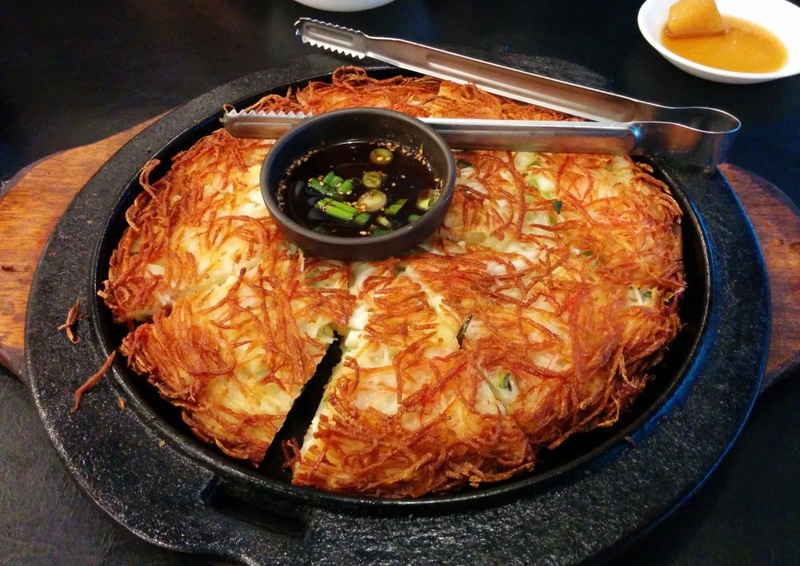 We also had to get their Seafood Pancake. There was enough seafood interspersed with the green onion and the pieces were thick. It was crispier than most other places but I liked it better than the one I had at Sura the week before. Finally we had their Sweet and Spicy Fried Chicken. At first they messed up our order and thought we wanted some other fried dish so they had to make it again. My friend thinks Yang Nyum? chicken is not suppose to taste like this but since I wouldn’t know I thought it tasted fine. I like sweet and spicy stuff so this worked out for me! 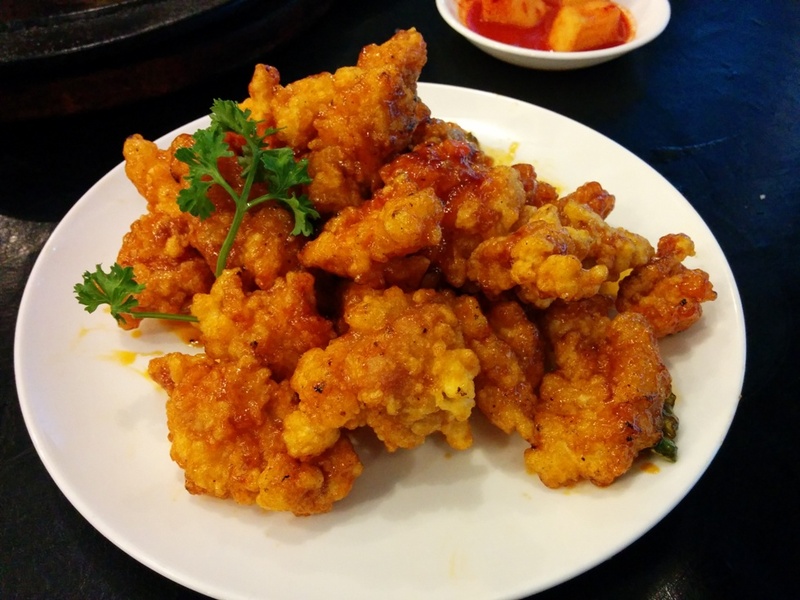 This entry was posted in Food Reviews, Korean and tagged fried chicken, seafood pancake, tofu soup.